With its remotely controllable Power Save outlet array, the TLP66RCG provides an economical green surge protection solution. 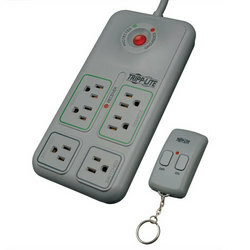 The included RF remote enables desk lamps, monitors and computer peripherals to be turned off with the press of a single button--a convenient feature for both home and business users. This new ECO-Surge Suppressor conserves electricity without compromising on reliable protection for valuable connected components.